Clinical supervision instructs, models, and encourages self-reflection of the supervisee’s acquisition of clinical and administrative skills through observation, evaluation, feedback, and mutual problem-solving. However, it should be understood that there might be opportunities in which the clinical supervisor chooses to give professional direction based on experience, expertise, and/or for ethical or safety concerns. Clinical supervision is delivered within the supervisor’s professional practice license and ethical standards. Clinical supervision is provided to all treatment/clinical staff who are either employed or under contract by a provider organization such as group practices or behavioral health specialty organization or an individual provider. Clinical supervisors need to meet the standards for clinical supervision as defined by their professional practice board. Continuously reviewed and adjusted according to an individual’s status, success and challenges. Teaching the importance of retaining continuity throughout all documentation. Ensuring plans, interventions, goals, and supports are appropriate to diagnosis. Clinical Supervision assures that discharge planning starts at the initiation of treatment and is continually developed throughout treatment. The discharge plan assures ongoing support for the individual’s continued recovery and success. Clinical Supervision assures that an appropriate safety and crisis management plans are in place at the onset of service delivery. Clinical Supervision addresses ethics and ethical dilemmas as aligned with the appropriate professional practice board. Clinical Supervisors will document date, duration, and the content of supervision session for their supervisee(s), which may include a professional development plan. All documents pertaining to clinical supervision will be readily available to the supervisee. A clinical supervisor has been approved by their respective professional licensing board as having met board requirements for providing clinical supervision. Please see http://www.rld.state.nm.us/boards/default.aspx for current requirements. Fulfillment of key life roles (e.g., a child being a successful student or an adult being a successful parent or employee). There are five basic functions of quality practice that must be performed for each person served to achieve the greatest benefits and outcomes. 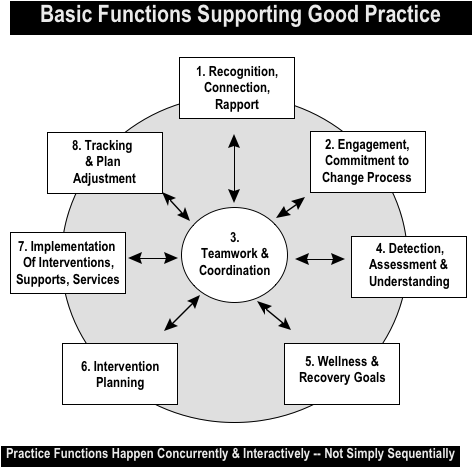 These functions listed below are foundational to quality practice and underlie all successful intervention strategies. Because these functions are essential to achieving positive results with clients served, the Behavioral Health Services-Division expects that each person served will, at a minimum, be served in a manner that consistently provides and demonstrates these core practice functions. Providing services to all clients in accordance with these practices is a top priority, and the Behavioral Health Services Division will support organizations to consistently measure their occurrence with clients served using Integrated Quality Service Reviews (iQSR), Clinical Supervision and Quality Improvement strategies based on their organization’s comprehensive and ongoing self-assessments. Agencies are encouraged to d e v e l o p strong internal clinical practice development activities including integration of the iQSR or other data-driven fidelity models. This practice framework sets forth the actions/functions used by frontline practitioners to partner with a person receiving services to bring about positive life changes that assist the person by maintaining successes and managing challenges as they occur. Typical activities in practice include engaging the client and other key stakeholders in a connected, unifying effort through teamwork and fully understanding the person, their needs and environment. It also includes collaboratively defining results to be achieved, selecting and using intervention strategies and supports, resourcing and delivering planned interventions and supports, and tracking and adjusting intervention strategies until desired outcomes are achieved. The practice framework also encompasses the core values and expectations for providing services. The framework functions to organize casework and service delivery, to guide the training and supervision of staff, and clarifies quality measures and accountability. Basic practice functions are illustrated in the “practice wheel” diagram below. The practice wheel can be utilized to guide supervision by providing a framework and expectations for working with persons receiving services. For example, supervision and training could progress along the practice wheel with each function as a topic of focus to strengthen and operationalize expectations. Clinical Supervision is the foundation for assuring consistent, high quality practice. It provides a mechanism for clinical practice improvement at both an individual staff level as well as at the organizational level. Provide support, consultation, and oversight of clients’ treatment to include assessment of needs; diagnoses/differential diagnoses (MH, SA, and COD); clinical reasoning and case formulation, to include documentation; treatment planning and implementation; refining treatment goals and outcomes; selecting interventions and supports; coordination of care; tracking and adjusting interventions. All of which should be continuously reviewed and adjusted according to an individual’s status, success and challenges. Teach the importance of retaining continuity throughout all documentation. Use parallel process where the supervisee’s development is being addressed alongside the emerging clinical issues. Address the supervisee’s steps to insure an individual’s active involvement at all levels and that the individual voice and choice are clearly represented and documented. Assure that discharge planning starts at the initiation of treatment and is continually developed throughout treatment. The discharge plan assures ongoing support for the individual’s continued recovery and success. Assure that an appropriate safety and crisis management plans are in place at the onset of service delivery. Address ethics and ethical dilemmas as aligned with the appropriate professional practice board. In addition to reinforcing multi-disciplinary teaming, group supervision can serve as a good teaching/training venue in which provider trends are highlighted (e.g. engagement, population profiles, and the presenting severity/types of disorders, theoretical orientation and case conceptualization.) The Clinical Supervisor’s experiences in group supervision can also inform and strengthen the work of the entire team through the use of a recognized Clinical Practice Improvement model. Assures high quality treatment for individuals. Assures the treatment plan is a living, working document with the individual. Ensures staff are trained and properly implementing Evidenced-based Practices. Both individual and group clinical supervision occurs multiple times during any month with documentation to evidence that clinical supervision has occurred accordingly. Addresses care planning consistent with: wraparound planning approaches; system of care principles; and, a recovery philosophy. Includes process improvement approaches, relevant data collection, fidelity measures and data for outcome monitoring. the licensing Board designating them as supervisors (LCSW or LISW) or their most recent CEUs in supervision that accompanied their last license renewal (LPCC.) Once approved, the provider will need to submit their Supervisory Certification notice to the MCO’s and Medicaid so that they can render services. Each time the provider brings on a new non-independently licensed provider, or changes supervisors, they will need to submit an updated roster (with all the columns filled out). For Supervisors, please include a letter from the licensing Board designating them as supervisors (LCSW or LISW) or their most recent CEU’s in supervision that accompanied their license renewal (LPCC). Policies that describe the provider’s clinical supervision of all treatment staff including their Human Resources requirements for the clinical supervisor (credentials, job description, skill sets, training requirements and schedules). Annual training plan for all staff that provide treatment services. Backup contingency plans for periods of clinical supervisor staff turnover. Evaluates the outcomes of its clinical interventions and develops improved strategies. State staff will monitor agencies for compliance with this clinical supervision requirement should the need arise. Dedicate resources and personnel (i.e., state employees or contracted clinicians) to provide technical assistance in identifying acceptable and appropriate policies and procedure through the Supervisory Certification process. Explore use of telehealth video conferencing as a tool in clinical supervision. Provide Clinical Reasoning and Case Formulation training and consultation to Clinical Supervisors. Provide training and supports for supervising specific to those working in integrated settings and teams.